The Lady Southern Cross soon after arriving at Oakland on 4 November 1934. The caption taped to the back of the photo reads: "After record flight across the Pacific. 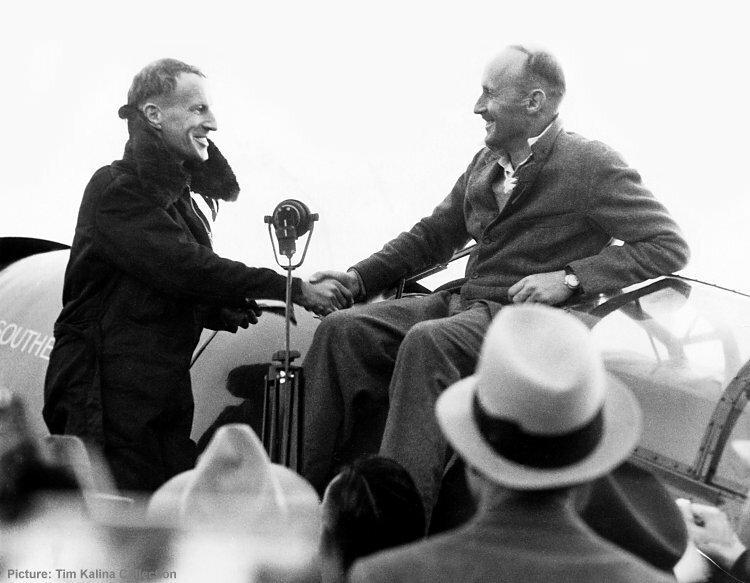 Oakland, Cal.-- Mutual congratulations are exchanged between Sir Charles Kingsford-Smith and his navigator, Capt. P. G. Taylor as they stand on a wing of the "Lady Southern Cross" on the termination of their record flight across the Pacific Ocean. The 7,300 mile flight started in Brisbane, Australia. The 2,400-mile last leg from Honolulu to Oakland was made in the almost incredible time of 15 hours. Crowds are welcoming the flyers at the airport. Flown by UAL! (E-11-5-34)-10"